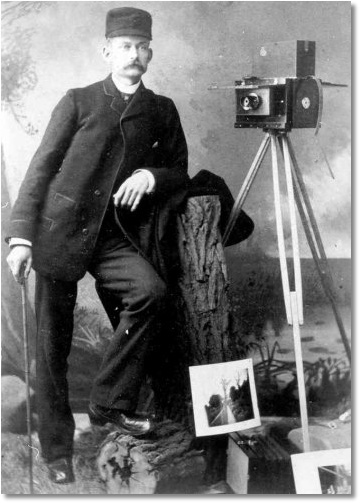 Penny Picture cameras are rare items equipped with modified backs allowing multiple portraits to be made on a single plate. This Gennert Penny Picture camera is a 5 x 7 polished mahogany multiplying view camera complete with a Cummins Photo Stock portrait lens incorporating the Petzval optical design. Cummins was a Baltimore based jobber that often private labeled equipment under their own name. The Cummins lens is very similar to a Darlot which may have been private labeled. A photographer's choice of lenses, and their ability to exploit lens properties, often made the difference between an average image and an artistic masterpiece. 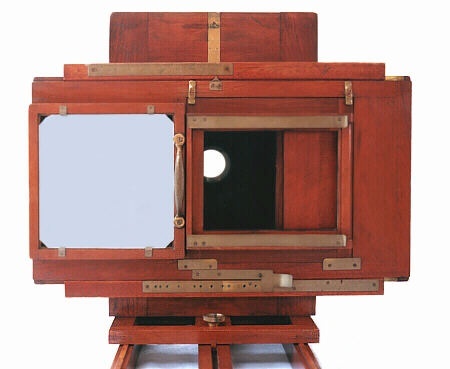 While multiplying view cameras were vehicles to mechanically create an image, portraitists prized their lenses, and development of the Petvzal optical design was critical to the fine art of portraiture. First introduced in 1840, the Petzval design was an innovative approach to create a fast flat-field lens suitable for portrait work. The Cummins portrait lens on this Gennert Penny Picture throws a fine, flat-field image with a graceful fall-off to the edges that was greatly cherished by 19th century portraitists as well as contemporary practitioners. Surprisingly, image fall-off is actually quite desirable because it draws a viewer's attention to the center of the portrait by softening the background. The Penny Picture camera's shifting back is a marvelous construction of polished mahogany panels and brass hardware. Brass guides allow the back to shift horizontally and vertically and be locked in place as needed.